Bookmark is an innovative cloud website builder, which is powered by the advanced AI technology. This is one of the highlights of the service, which makes it stand out from the crowd and attracts inexperienced and proficient web developers from all over the world. The website builder offers professional help of the powerful AIDA assistant that guides you through the entire web building process, designing a decent website for you from scratch. AIDA is unique and delivers exceptional web building experience to everyone, who uses it. The platform works well for the development of business websites, web stores and landing pages that initially come with responsive design. It is claimed to feature exceptional ease of use, but is it really so simple and intuitive for everyone? Can AIDA cover the majority of your web building needs with ease or you still need to possess programming knowledge? To clear that out, let’s have a look at some of the best Bookmark website samples to define their pros and cons. Briskybusiness.com is a one-page website offering an advanced product for business management known as Brisky. This is the automated customer engagement tool that acts an intelligent customer support manager tracking customer behaviour and engagement rate. The website is logically-structured and delivers all the required information about the product – its overview, features, results and customer list. There is also an opportunity to order the demo version of the program by filling out the contact form available at the website. Users have an opportunity to download the program without the need to look for it elsewhere – Google Play and App Store buttons are within reach here! 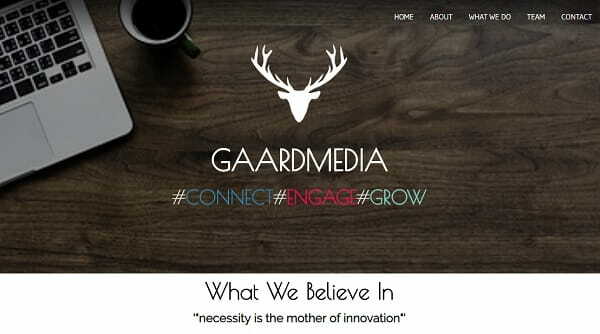 Gaardmedia.com is a website of the full-service social media marketing agency that focuses on delivering social media services, developing and executing digital campaigns. This is a one-page website, which includes several important sections needed to provide users with all information they are interested in. These are About, What We Do, Team and Contact sections. The website looks simple yet unusual due to the pop-up catchy slogans that appear as you scroll down the page. Social network buttons allow exploring the services in details on external resources, strengthening company reputation. There is also the call-to-action “Let’s Talk” button, which encourages users to get in touch with the team to discuss their project ideas. That’s exactly what most users need, when choosing the SMM company. 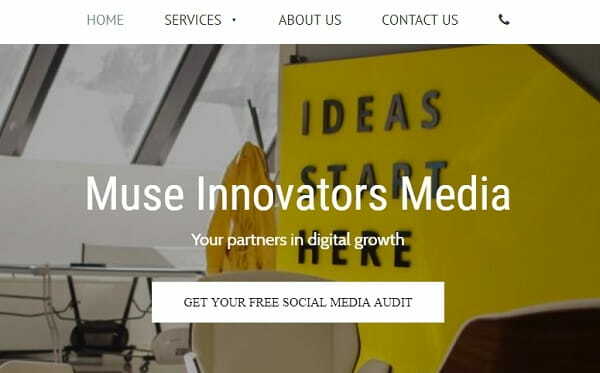 Museinnovatorsmedia.com is a website of a digital marketing agency that focuses on the development of social media strategies and promo campaigns for small businesses and personal brands. The website looks simple at first sight, but when you start exploring it, you make sure that it’s well-structured and functional. It contains several menu sections, which provide the required company-related information all in one place. The Services section comes with a drop-down menu to ensure maximum efficacy of search and ease of use. There is an opportunity to book an appointment with the company representatives, specifying the prefered date and time. Likewise, you can create your free social media account by using the button available at the home page. This is quick and convenient for everyone. 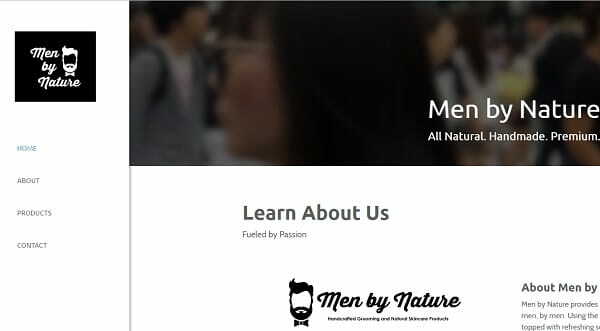 Menbynature.com is a web store offering a variety of handcrafted skincare products for men. The products available for sale are 100% natural, organic and eco-friendly – this is exactly what makes this eCommerce website so trendy. The online store is logically-structured, with the menu consisting of four major sections, namely Home, About, Products and Contact. The website has a white background with product images and a live video integrated into the header of the home page. The call-to-action is realized through the “Click Here” button that redirects a user to the product list. The featured products, social media buttons and the newsletter sign up feature are available at the home page. It’s possible to track the order, look through the product’s specifications, share it with the friends in the social networks and save as a bookmark. This ensures quick, convenient and time-saving shopping process. The very first thing that catches the attention when you visit Allthingsnewwtn.com is an unusual image slider available in the header. It presents the mission of the website in the best way possible as All Things New is a place, which can help make your life and personal belongings more organized. The menu of the website is available on the left panel to save place and not to distract user attention. The sections it contains – Home, Organizing, Downsizing, Design and Contact Us – provide access to all the company-related information and the services they offer. The images look distinct and alluring on the white background to emphasize the most crucial aspects the company covers. The website is a decent Bookmark sample. Torontors.com is a top destination for Toronto-dwellers looking for a professional floor restoration company. There is much you can find out at the website, ranging from the general business info and up to detailed customer reviews that give the unbiased assessment of their work. The website gallery is extensive and rich and there are multiple high quality original photos of successfully completed residential and commercial floor restoration projects. There is also quick access to social accounts and contact information, which is very detailed and comes up to various users‘ needs. This Bookmark-based website is a great combination of style, elegance, convenience and informational value. Pakapakastore.com is a nice sample of a Brazilian web store offering office supplies, namely notebooks and pens for kids and adults. The products look entertaining and unusual – just like the entire web store design. The color palette of the website is pink and white, with bright samples of the web store products. Each of them comes with price and parameter specifications, although, there are no detailed product overviews here. There is also access to social network accounts here and to the contacts section with the online form, where everyone can place an order. The English version of the web store is not available as well, which complicates the shopping process for customers. Clearpaymidsouth.com is a website of the ClearPay company offering financial solutions to businesses and industries based on their particular needs. The website looks trusted and modern from the very first sight. It covers an extensive range of information clients would like to know about the company. There is a detailed description of each service offered at the homepage of the website. This should help potential clients decide on their current needs and services they may avail, when dealing with the company. The menu is found on the left website panel. It consists of several points only to simplify users’ choice. It is also possible to get a free assessment in the shortest time possible by using the CTA button. A stylish, contemporary and credible sample of a business website built with Bookmark. Shivysindiankitchen.com is the name of the website that speaks for itself. This is the online store of the most delicious Indian cooking staples. 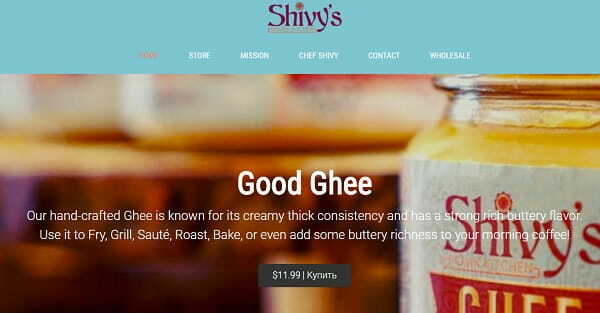 However, there is only one product – Shivy’s Ghee- currently sold at the website. Probably, other products are going to be added to the product list soon. The web store sees its mission in encouraging customers to donate hot and nutritious meal to poor and homeless kids in India. The website makes it possible to share the product links in social networks, sign up for a newsletter to stay aware of the web store updates and get in touch with website owners by filling out the online form available in the Contacts section. 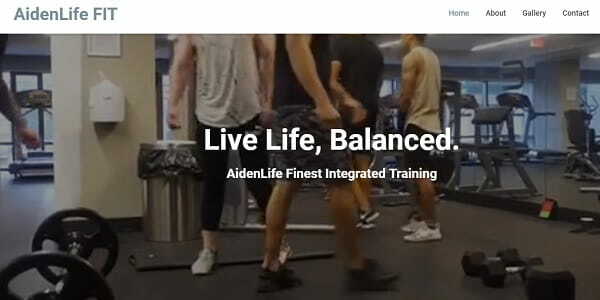 Aidenlifefit.net is the top notch place for everyone, who is a fan of balanced lifestyle and is looking for a way to improve health condition. The AidenLife FIT studio has different programs, services and suggestions to change the lifestyle of each client for the better. The website of the web studio corresponds to its major mission. Video background available at the home page urges the desire to keep browsing the website to find out more about the services offered. Everyone, who wants to try the studio services out, may book the first session for free directly at the homepage. There is also an extensive photo gallery, social network accounts and detailed contacts of the studio with exact Google maps location at the website. Bookmark is a contemporary and easy-to-use platform for everyone, who needs a decent website for personal or business purposes. This is a nice choice for building small-to-medium eCommerce websites, which aims at decent business presentation and customer engagement. The highlight of the website builder is its advanced AIDA assistant that simplifies the web creation process, makes it engaging and offers a variety of integrated themes to come up to versatile users’ needs. All samples of Bookmark-based websites have contemporary designs and feature simple yet intuitive navigation. 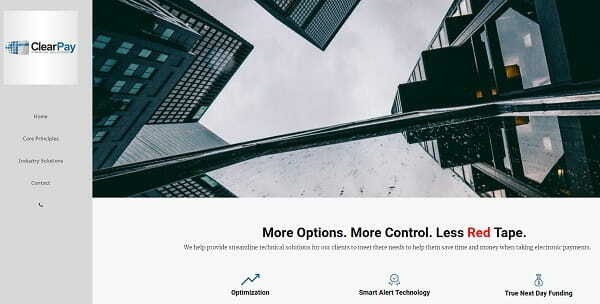 There is nothing complicated about them, but this is an advantage in itself for users, who lack web design skills and wish to get functional websites designed with Bookmark AIDA. A great choice to cover your personal and business web design needs!